Metalsistems boltless system allows its user to simply and easily assemble the shelving unit without any special tools or know-how. Made from prime quality tensile steel, this unit is built to last, and holds up to 330lbs per shelf and 2,500 for the entire shelving unit. With a wide range of accessories and configurations you can build and create many different options for the space you have available. The DEWALT Swivel Seat Shop Stool was designed to provide heavy-duty seating fit for both professional and home use. The comfortable foam-padded seat sits atop a 360-degree swivel allowing free and easy rotation when seated and the textured vinyl cover resists rips and tears. A bracket-secured industrial wire grid lower shelf provides an ideal place to store necessary tools and supplies. Featuring a powder-coated, all steel frame construction this stool can easily hold up to 300 lb. without showing any signs of weakening or metal fatigue. This stool features a version of the rugged, glass-filled nylon feet used on the storage racks that has an adjustable levelling pad as part of the foot. Made of reinforced nylon material, these levelling feet can be easily adjusted by hand to eliminate any wobbling of the stool in addition to preventing damage to flooring. The bolt-secured frame comes pre-assembled with only the seat needing to be attached before the stool is ready for use. Honey-Can-Do's versatile 4-Tier Steel Wire Floor Accessory Rack provides fours levels of easily accessible storage space with a simple design. These sturdy wire shelves are perfect for sweaters, shoes, bags or anything you'd like to keep tidy and visible, while a slightly elevated shelf back keeps items in place. Great for the laundry room, bedroom closet, garage or mudroom, it's the perfect solution for getting that annoying clutter off the floor. Complete the look of your garage with this beautiful Bold Series 2-Door Base cabinet. This cabinet is fully welded and constructed with 24-Gauge steel. It includes a fully adjustable shelf with a weight capacity of 200 lbs., adjustable levelling legs, full length anodized aluminum handles and an easy access cut-out for cables at the bottom of the cabinet to charge your tools while being securely locked. Metalsistem Add-On Unit 78 Inch Height x 36 Inch Width x 16 Inch Depth With 5 Metal Shelf Levels Metalsistems boltless system allows its user to simply and easily assemble the shelving unit without any special tools or know-how. 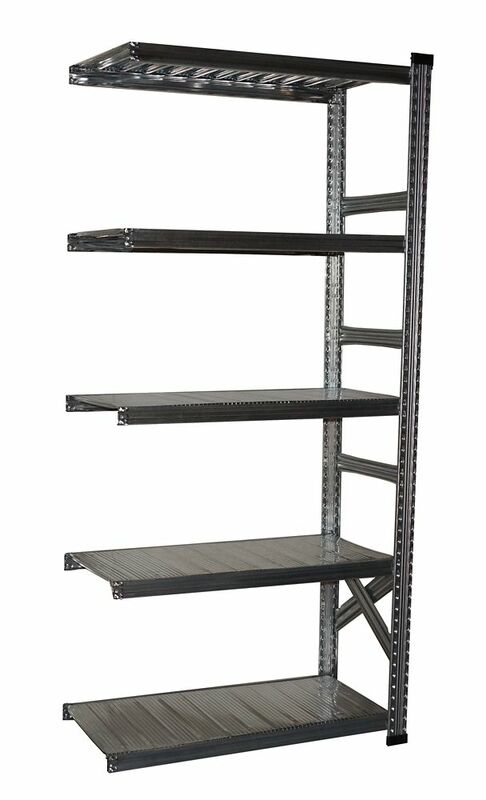 Made from prime quality tensile steel, this unit is built to last, and holds up to 330lbs per shelf and 2,500 for the entire shelving unit. With a wide range of accessories and configurations you can build and create many different options for the space you have available. Metalsistem Add-On Unit 78 Inch Height x 36 Inch Width x 16 Inch Depth With 5 Metal Shelf Levels is rated 2.0 out of 5 by 1. Rated 2 out of 5 by elleray from no instruction The Add On is new design, but no new instruction sheet together with the package.